I can’t believe October is almost over. It’s sad to see the summer go but now it’s time for boots, sweaters, and tights. Over the past couple of weekends, I started switching my wardrobe for the colder season. I felt it was necessary because I made a purchase and realized I had duplicates. October is the month I officially start wearing boots. 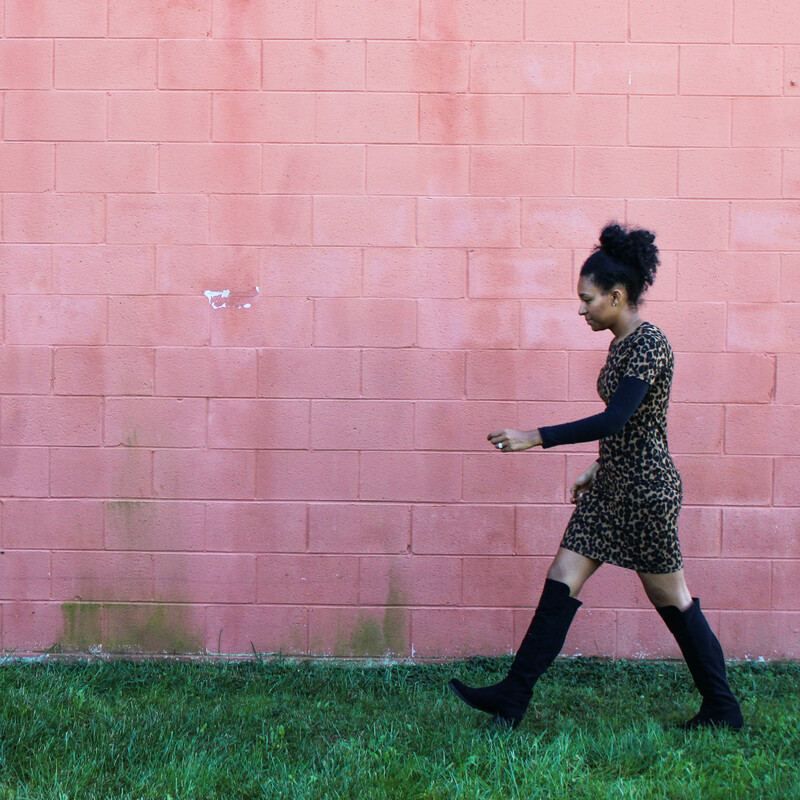 A few years ago, I found myself struggling to find a good balance of when to wear boots and cooler weather attire. I felt I was rushing the season when I tried to wear these items in September, plus it was still way too hot. November, I would freeze trying to find different ways to make my sundresses work in the colder months. I decided enough was enough, October is a great month to make it happen and it seemed to work. Today it’s going to be 80 degrees, but I am wearing a short sleeve sweater and cropped pants. This year I tried something a little different, and it seemed to work great. I pulled out my fall items and stored them on clothing racks so I can see what I have and what I need. I found I had no idea what I stored and found myself buying things I already had. I just got in an order from J.Crew and saw I ordered some of their tissue turtlenecks in colors I already had, and now have to go through the whole return process which could have been avoided. Do you have a certain time you start wearing certain articles of clothing? The weather has started to get chilly. It’s not warm enough for a coat but I do need something more than just a shirt. In that case, I opt for a vest. 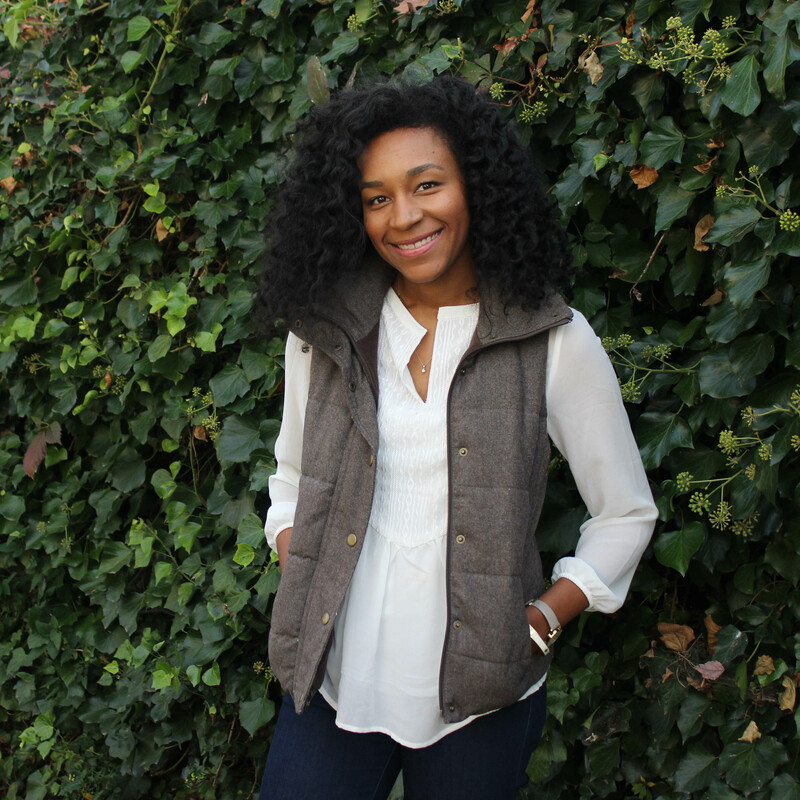 Vest are the best way to add something fun to an outfit and it keeps you warm on the cooler days. This dress is from Old Navy, and I think it would be super cute with booties. You all know how much I love stripes, so when I saw this it was an immediate yes to add to my closet. I am always looking for dresses that are so easy to just throw on. I love pieces that make you feel pretty but are still super comfy. Hi Friends, have you heard it’s officially fall! Which means I am officially excited to refresh my wardrobe and share new things with you for this new season we are entering. It actually started to get cool here in the DC area, but I’m not sure it will last the rest of the season. Nonetheless, I am excited to find some fun new items. Camo Crew Sweatshirt – Camo is on trend this season and I can’t even express how excited I am about it. I have always loved camo and so happy that it is gracing my closet this season. Denim Mini Skirt– This is a classic staple that has been missing from my wardrobe for a couple of years. It seems like denim minis are in every store this season. I haven’t found the perfect one yet, but I have my eye out for the best one. 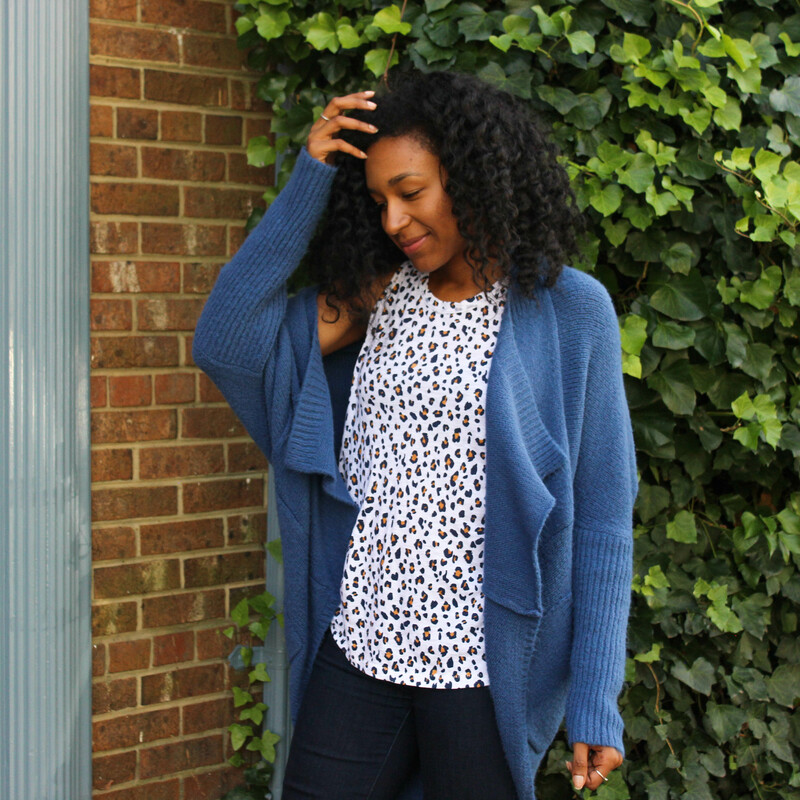 Mockneck Sweater– Sweaters are something I like to refresh my wardrobe with every season. When I saw this color it just screamed fall to me. 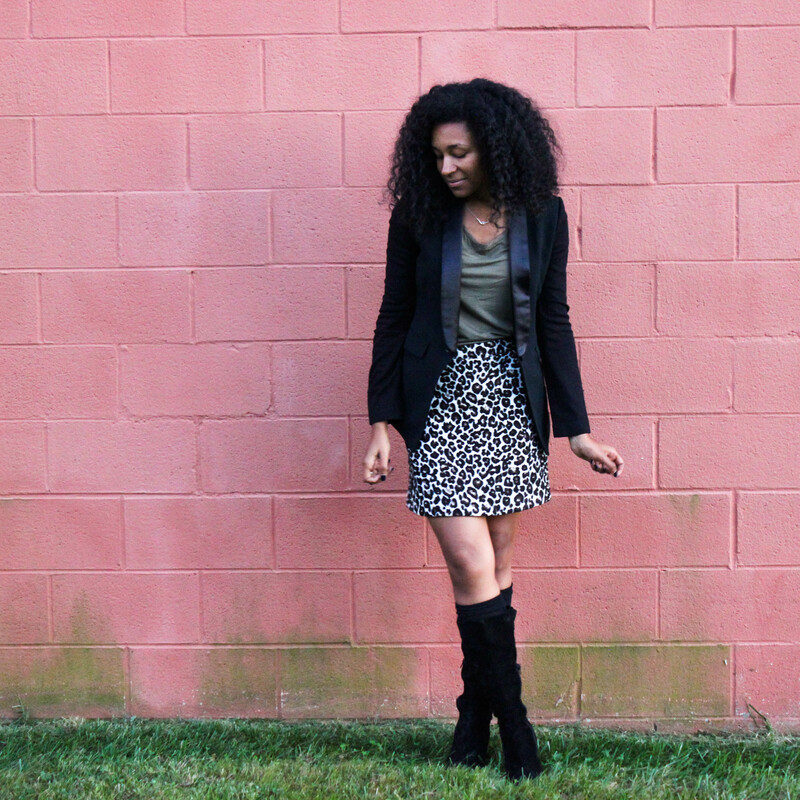 Faux Leather Jacket- This is a part of my fall uniform. Moto jackets make just about any outfit and I like to add an update to my wardrobe each season. I may have more than I need at this moment, but it seems like every year it all about the updated colors. Riding Boots- Boots are a necessity for the fall. Just like the moto jacket, it is always a good idea to update your boots each season. Riding boots are my favorite, currently, I have a tan pair and would love to acquire a black pair. Wideleg Pants– these pants, in particular, caught my eye, I have nothing like them in my closet which is why they made this list. Every wardrobe needs a wildcard. Plaid Backpack– I like to buy a new purse or bag each season. Plaid is always a fun print to play within the fall, I thought this would be something different. Floral Top- Floral is in this year, and I don’t plan on missing out on this fabulous print. I like this top because it can go with just about anything, a moto jacket, cardigan, or even on its own. 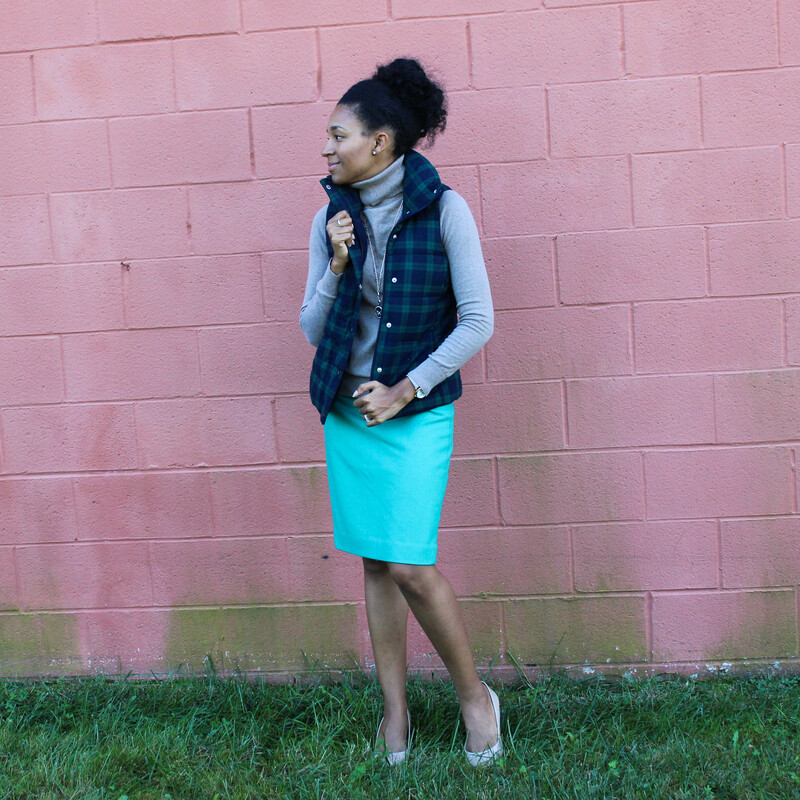 Have you all ever worn the pencil skirts from J Crew? I have them in a few colors and I can promise you once you wear one, you will want them in all the colors they come in. The good thing for your closet (but not your wallet) is that J Crew comes out with new and different colors every season. They go great with many things, boots, booties, flats, sandals, and dare I say sneakers if you want to get funky. It has been much warmer than I think it should be for the fall. I have been buying things that are way too hot for this 80 degree weather. I am not letting that stop me. Notice, I am not wearing stockings 🙂 That is the great thing about wearing boots. They keep you warm with the weather changing hour by hour. Happy Tuesday, today is a little bit of torture for me. Yesterday was a holiday, and now getting back into the swing of things is always hard. Last night I stayed up much later than I should have. So I am feeling it today. All and all, lets make the most of it! Today I wanted to share this simple outfit with you. 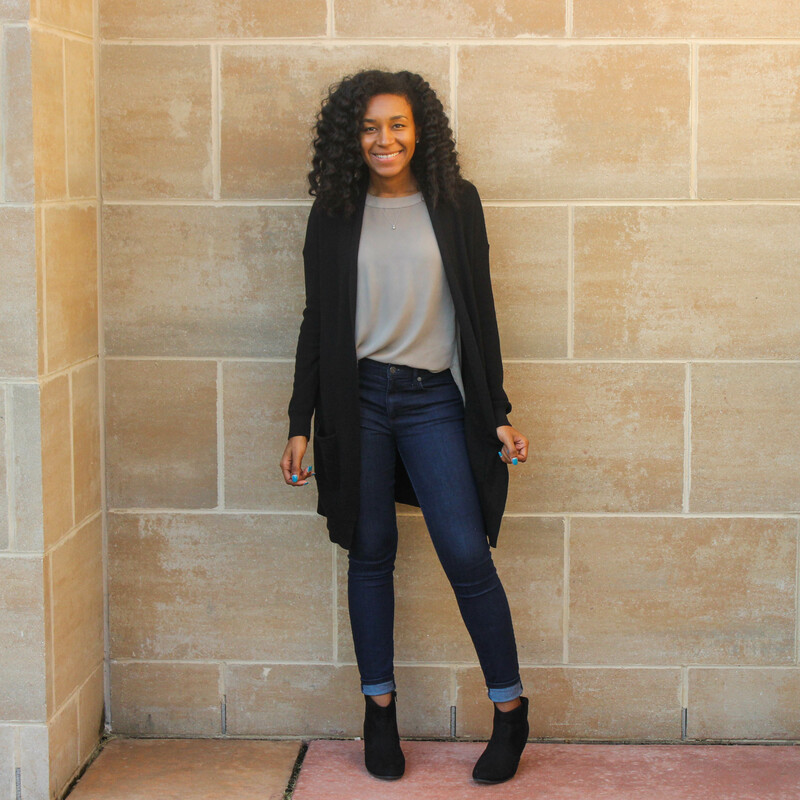 If you are looking to make your outfit a little more polished, a long cardigan is the best way to do it in the fall. It’s so easy, all you have to do is put on one sleeve at a time 🙂 Booties help too, but if all you have is flats- go with it!! !